As more people opt for stoves in their houses, more people are choosing to train as chimney sweeps. The National Association of Chimney Sweeps (NACS) has reported a growth in member numbers over the past thirty years, from 30 to more than 450. All new members are required to undertake compulsory training at the body’s HETAS-approved training centre. NACS attributes the rising interest in woodburning stoves to a combination of being desirable and offering a cheaper alternative to gas and electric heating. And when it comes to chimney sweeping, the trade has undergone a major transformation since its early days – modern sweeps are as capable of installing stoves as they are of sweeping chimneys. Forget about images of small boys being sent up soot-laden chimneys and think instead about protective clothing and modern equipment, as today’s chimney sweeps use the likes of CCTV cameras to identify any issues. Vice president Stephen Howard, a sweep since 1990, who coordinates the training of new tradesmen, said: “Years ago a chimney sweep was just what you see in Mary Poppins. Now, people’s perceptions are changing. People want a professional job. Sweeps have specialist equipment like CCTV cameras or smoke monitoring machines to find problems. If you’re considering investing in a woodburning stove, you’ll need to get the chimney swept first. This time of year is good for sorting this task, as chimney sweeps are naturally less busy in the summer – which is why buying a stove at the moment makes sense. You’ll have time to decide which stove is right for you and you may even be able to make the most of any summer offers, as well as easily arrange for the chimney to be swept and the wood burner installed. A New Forest hotel has introduced a range of green initiatives including a wood burning stove for hot water in a bid to keep its carbon footprint low. The Standing Hat room at the Cottage Lodge hotel in Brockenhurst boasts a wood burning stove that powers the hot water as well as a bicycle-powered TV, and furniture made from recycled wood from the local area. 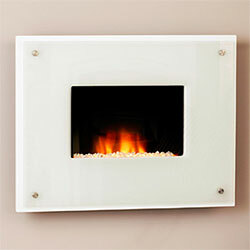 Environmentally friendly, a wood burning stove is ideal for anyone seeking greater heat efficiency. The energy rating of the average modern wood burner is in excess of 70%, compared to the maximum energy rating of an open fireplace which is 25%. This means you get almost three-times the heat from the same amount of logs because of the increased efficiency, saving you money and helping you to be kind to the planet at the same time. Plus, wood is virtually carbon neutral as it only releases the same amount of carbon dioxide when it’s burned as it absorbed during its lifetime – and if you buy your logs from a sustainable source, a new tree is planted for every tree that is felled, maintaining the carbon neutral cycle. With a woodburning stove, you can even make your own logs from unwanted papers, newspapers and cardboard. It is little wonder that business owners seeking to reduce their carbon footprint are opting for wood burning stoves to heat their premises and generate hot water. Recently, two new stoves were installed as part of the Hardwick Hall renovation – and now a hotel in the New Forest has incorporated a wood burner into its green design. The hotel’s owner Christine Simons said: “Customers love cycling the bike that we have had installed to produce energy for the TV. They want to light the fire to warm their water and also enjoy sleeping in a stunning hand-made four-poster bed constructed from a locally felled beech tree. It is sensual, inspirational, and quirky. I wanted to show that being green can also be exciting and fun. In addition to the room’s stove keeping hot water warm in the winter months, there are solar panels on the roof to produce hot water in the summer. Another key green feature of this hotel is its bicycle which enables visitors to generate their own power for the TV – and if they get too tired, the photovoltaic cells on the roof also create power. So there should be an opportunity for hotel guests to unwind in front of the woodburning stove and watch TV guilt-free, knowing that some of the power was generated by their efforts on the bike earlier! The bed and bedroom furniture were crafted from wood recycled from the local area, and the windows, doors, tiles and piping are all reclaimed or recycled. Are you more inclined to stay at a hotel that has taken measures such as installing a wood burning stove to be environmentally friendly? 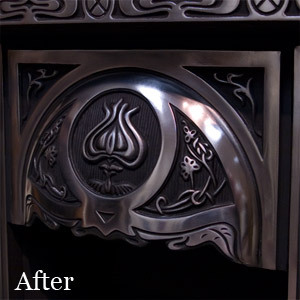 With traditional Cast Iron Inserts and fireplace surrounds still incredibly popular and many purchased with the aim of keeping you warn in the winter, we take you through a few a few of the basics to make sure your polished areas stay as bright as gold. Before you start it is a very good idea to prepare everything you need so your not having to run off to find something in the middle of cleaning. For this guide I will be polishing a new Cast Iron Insert but old cast iron is not much different. Once you have your equipment you are ready to bring your cast iron to a beautiful shine. Firstly you need to ensure you wear your gloves when using the wire wool and polish. Take your metal polish and apply a small amount to the your wire wool. With this start to rub the polish into the metal using a firm hand covering a good sized area. Repeat until you have covered all polished areas. If you have an old cast iron there may be rust on the polished areas if you do the rust will take some extra elbow grease but the majority if not all should come off. When you have completely polished the cast iron using the wire wool and polish take another piece of wire wool and work the surface of the polished area to achieve a good level of shine you are happy with. Using a small amount of metal polish on a new piece of wire wool work the polish in again to build a protective coating onto the polished areas to keep the shine looking new. wood-burning stoves and biomass appliances. Its chairman is Phil Wood of NIBE Stoves and the deputy chairman is Hugh Wells of Charnwood Stoves. With more than 35 members ranging from manufacturers and distributors of stoves and flue equipment, its objectives are very much supported by government initiatives to reduce our dependency of fossil fuels and reduce carbon dioxide emissions. The SIA works closely with HETAS which is a government recognised body for the testing and approval of biomass and solid fuel domestic heating appliances, fuels and services, including the registration of competent stove installers and servicing businesses. The Stove Industry Alliance represents many of the leading and, in some instances, household names such and such as AGA, Broseley, Charnwood and Firebelly in the manufacture, distribution and sale of wood burning stoves and biomass appliances. The Stove Industry Alliance is working to help promote the use of wood-burning stoves. THIS lucky duck got a mum in a flap — after falling down her chimney straight into a roaring fire. Stunned Helen Marsh was watching telly at home when she heard a “whooshing” sound and soot started billowing from her fireplace. It got so thick she was forced to leave the room — returning to find the flustered mallard sitting on her sofa nursing singed tail feathers. She managed to trap it in her porch where it sat in a box lined with newspaper until the RSPCA took it away to release into the wild. The duck was thought to have been sat on Helen’s chimney stack — and lost its balance. Helen, of Solihull, West Mids, had to pull up her sooty carpets and redecorate. She said: “When I told my friends, they didn’t believe me — until they saw the state of the room." Olde Englande Reproductions (O.E.R.) offer a Complete Collection of Exclusive Fireplaces, award winning fireplace manufacturer's of solid timber/wood surrounds, mirrors and interiors. 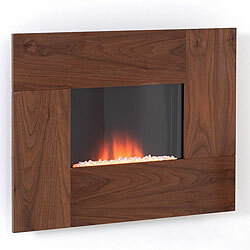 OER are the number 1 UK manufacturer for wood/timber fireplaces. Currently holding the record in the UK for achieving the most National Fireplace Awards for design and quality, this really shows just how much design and quality mean to OER. In addition they also won the Horizon Award in 2009 and the much coveted "Wise Owl" Lifetime Achievement Award in 2006. With over 33 years knowledge in the fireplace industry you can rest assured that you will invest in a fireplace, fire or stove that has been made with pride, ensuring the best quality, exclusivity and reliability. All their fireplaces are designed and manufactured in-house by a team of craftspeople, allowing manufacture to size, material choice and colour on most designs, also allowing the flexibility to adapt the fireplace to suit solid fuel use. Solid wood surrounds can be manufactured in Oak, Pine, Mahogany,Maple,White or cream, all interiors and chambers are unique, including the Greystone Chamber and lighting kit featured on the Belgravia or the Beige Quartz of the Caledonion. 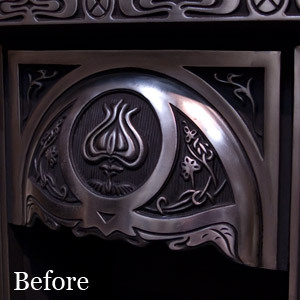 The OER collection features some of the finest hand carved exclusive fireplaces available and are all British made. Available have a network of "Approved Stockists" throughout the UK, for a full professional service, we recommend you choose your nearest stockist and they will assist you in choosing your perfect fireplace. A new smartphone app to encourage confident conversations between home-owners and tradesmen was launched on Tuesday 19 June, at an event attended by trade bodies and consumer protection groups. Developed by TrustMark, the free app is designed to prompt homeowners to ask the right questions when tradesmen are quoting for work. The Secretary of State for Business, Innovation and Skills, Vince Cable (Right), was there to promote the app, saying that anything that can reinforce consumer confidence is welcome. “The new application provides another useful tool to consumers by bringing TrustMark’s expert guidance directly to householders through the latest innovative channels,” he said. Following 11 simple steps, homeowners are able to write down answers and agreed details at each stage and generate an instant record that can be emailed to the tradesman. By adding text, photos and audio recordings, an accurate record of the conversation is logged providing clarity for both parties. The app was championed by Stephen Lloyd, MP for Eastbourne and Willingdon who also sees it as a valuable tool for Green Deal projects. The chair of TrustMark, Liz Male (above), was particularly grateful for the support shown by the ministers and their departments. ‘We understand that communication is vital to a good working relationship between a homeowner and a tradesman,” she said. She highlighted the £2 billion worth of work that could be created by the Green Deal yet falls outside of Green Deal funding and protection. “TrustMark is the only scheme backed by government that gives protection to the 14 million households who will start commissioning this kind of work,” she said. Research commissioned by TrustMark revealed that over half of British homeowners (54%) admit they forget to ask the right questions when they invite tradesmen into their homes to quote for a job, and almost one in five forgets to ask a really important question. Younger homeowners are particularly vulnerable and lacking in confidence, with almost half (46%) turning to their parents for help. Ron Gainsford, chief executive of the Trading Standards Institute, said it was all about empowering consumers to make the right decisions. “It’s also of course about helping good business, and there are so many good businesses that want to compete in a fair and equal market, one that’s genuinely competitive and one that’s not subject to the trials and tribulations that some traders may choose to introduce into the market place,” he said. Paul Ramsden non-executive director at TrustMark said he thought an app would be beneficial in order to keep up with current trends. The Trust Mark app is currently available for iPhone, with additional versions for other smart phones coming later this year. A paper copy of the questions and guidance is also available. To download the app, visit http://www.trustmark.org.uk/apps. 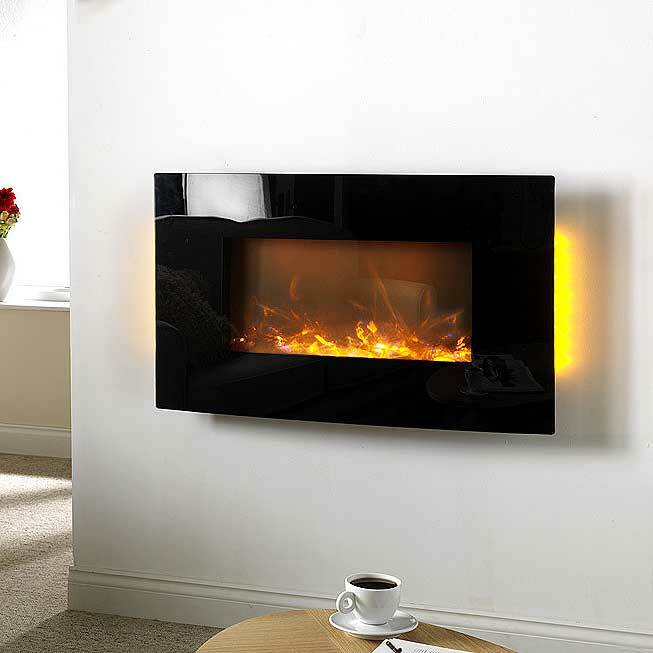 Proud UK manufacturer Evonic Fires has added to their range of strictly showroom exclusive electric fires with a couple of eye-catching electric fires that certainly break the mould of black glass, flat hang on the wall electric fires that have become all too commonplace in recent times. Named the Octane and Volante these two stunning electric fireplace suites offer a presence not normally available with hang on the wall electric fires. Appearing to float the Volante and Octane feature the same dancing ribbon effect that gives a truly unpredictable flame picture and white pebble fuel bed. The Octane is the smaller of the range and is shown left, while the Volante is 44 inches wide, offering the a contemporary alternate to small fireplace but without sacrificing floorspace, or requiring carpet to be cut around it. The Calcite white top and bottom platforms create a stunningly modern aesthetic with the flame effect dancing below the 2kW remote control fan heater, capable of quickly taking a cold edge off a room. Contrasting the warm glow through the pebble and log fuel effect on the Octane that really helps create a warm ambience around the fire, even with just the flame effect. Another brilliant feature on the Volante and Octane is the addition of slightly tinted glass strips either side of the flame effect, these can give stunning reflections of the flame effect, adding another dimension to a fire that already stands out from the crowd. With the release of the more upmarket Apex Havana electric fires just behind us, Costa Fires have answered and have released the new level Costa Epic hang on the wall electric fire. 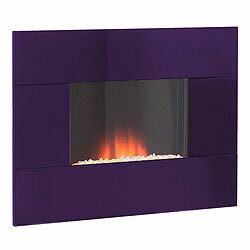 Delivering a high-quality hang-on-the-wall electric fire at an incredibly affordable price without compromise. The Costa Epic features the time-tested and popular ribbon flame effect with contemporary white stone fuel bed with the option of a vast range of trims to choose from. Ranging from the Epic Black Glass that gives a very contemporary finish to the strikingly modern Epic White Glass and for those with a more traditional decor the Apex Epic is also available with an Oak or Walnut effect fascias. Following from the massive success that Apex Fires have had with the Mirage Curved and Flat Widescreen Deluxe Electric Fires they have spent the last 12 months developing a successor, taking advantage of the increasingly popular and low energy LED flame effect and they have recently unveiled the fruit of their efforts, The Apex Havana. Available in both a Flat and Curved models, just like its predecessor, but the Apex Havana improves in a few key aspects and we are going to take a look into this and showcase the latest fire from Apex. While similar in width the Havana electric fires offer a larger view of the flame effect thanks to a larger overall height, this allows you to enjoy the flame effect from wherever you are in the room. Featuring the same backlight options but with a higher heat output of 2kW the Havana will help take that cold edge off a room very quickly. Also featuring luxurious features such as remote control and 3 different brightness settings of the flame effect, also choose from contemporary pebble, traditional log or stunning flame effect only options. The Apex Havana is an affordable luxury and certainly a fire destined to be very popular like the models it is replacing. What To Do With Ash From Your Stove? For those of us wanting to buy, or already own a wood or multi-fuel stove one of the thankless tasks related to essential upkeep of the stove is emptying the ash pan. This can be a very messy task and certainly not one that many people look forward to. If you're burning wood efficiently you shouldn't really have a lot of ash with some manufacturers such as Burley stating that Fuel is burnt so economically and completely that in tests the ash produced from burning a 100kg stack of logs can fit into a pint glass in one of their wood burning stoves. We have a quick look at some of the ways you can utilise the leftover ash from your stove. Firstly you must let your ashes cool before doing anything with them, I have an ash bin - this is essentially a metal bucket that sits on the hearth with plenty of clear space around it. I put my hot ashes into this bucket and let them cool overnight before composting them or throwing them away. This avoids frequently walking around with very hot ashes in your stove's ash pan and is a neat way to let the ashes cool down. If you're an avid gardener and looking for that extra little bit for your garden then remember that wood ashes are good for the ground. Mix layers of wood ash into your compost.It is also a good idea to add some layers of scrunched up paper or cardboard to allow air in to the compost heap, this returns the leftover, unburnt carbon to the soil and continues the Carbon Cycle. You can also use them to discourage pests like slugs and snails build up little walls of ashes between your vegetables & around your plants. Coal ashes are not good for the soil as they contain concentrated levels of heavy metals and toxins and should be thrown away in your bin - once they have cooled. Only use ashes from wood burning as it better for the ground - ashes from coal burning belong in the rubbish bin, if you are concerned about the quality of your earth.